We supply a huge variety of growing kits and plug spawn that cover many different strains of mushroom. Many of our mushrooms are grown by those who want to use them for culinary purposes, such as our enoki mushroom. 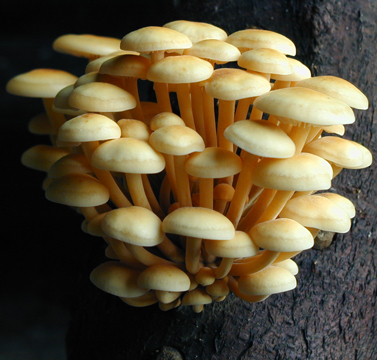 Known as enokitake, this versatile mushroom is a popular choice for growers as it thrives in the British weather and climate. We have a complete mushroom grow kit to help you grow this delicious variety yourself at home. The enoki mushroom is growing in popularity in the UK as its culinary use becomes more and more appreciated. The mushroom itself differs wildly in appearance: shop-bought enoki mushrooms are well known for their long, thin and noodle-like stems, with tiny white caps dotting them. 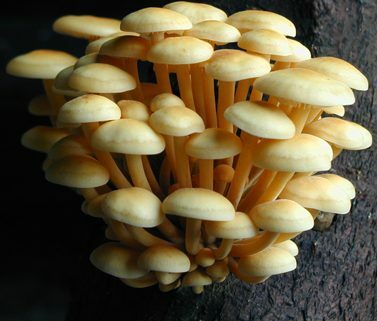 However, this is because they are grown without light, and the wild enoki mushrooms differ in this respect. They do have rather long stems (although shorter than store-bought enoki), the stems are thicker and brown, and they are topped with a wider cap that is tinted orange. The mushroom is commonly found from October to May and flourishes even in cold weather. They are known for being used extensively in culinary applications. They can be cooked in about thirty seconds due to their small size, meaning that they are often added in the later stages of a dish. Their flavour is quite mild, though they have a firm and quite crunchy texture which makes them ideal for use in salads, stir-fries and noodle dishes. Enoki mushrooms are very versatile and can also be pickled, frozen, or dried for later use. These mushrooms are also known for their health properties. They are high in protein, amino acids and dietary fibre, and contain a large amount of vitamin B1 and B2. They contain a healthy dosage of antioxidants and have even been linked to possible cancer prevention. They can also provide a significant boost to the immune system, rounding off the positive properties that they provide. For those looking to grow their own enoki mushrooms at home, we have a mushroom grow kit designed to provide you with all that you need. Our DIY mushroom log kit contains plug spawn and an 8mm drill bit so that you can drill holes of the correct size into the log. Also included is 20 grams of soya log wax to help seal the log, as well as a wax application brush. You will also receive a booklet that contains instructions and recipes to help you get the most out of your kit. These kits make for a good gift for the gardener in your life, and are also useful for chefs who want to exercise their culinary muscles and grow these versatile mushrooms themselves for use in their cooking.